As you probably have noticed i am back from my shore leave and back in game.Once again i will be available again for promotion requests when the requirements are met. Do understand that it can take up to a few days max. So a week ago Cryptic annouced the new K13 Fleet Station Holding.That means our fleets will have to put all efforts in preparing for the release, cause allot of resources is needed to level it to the max.I believe the release date is still to be annouced. Possibly A New Armada for Echelon Division. Theres a option to join the AS armada fulltime with both fed fleets, instead of just 2nd Division. This would mean better cohesion/relationship with 2nd Division and Our Armada with Apocalypse Survivors, however Echelon Division would go down a bit in Armada lvl & bonuses. So there for i ask the question, what you guys think of this. Personally i can go either way with no preferences, so that why i ask the fleet. Let me know your thoughts. Looking for Admirals for Division & 2nd Division. If your interested let me know by replying. This is a general reminder for the Echelon Aliiance chat. The ''Echelon Alliance'' channel is a chat hub for all echelon fleets (Echelon Division, Echelon 2nd Division and House of Echelon) This channel is mostly used for communications towards the other fleets, share tactics and make groups such as stfs.Its really recommended to have this channel, it is usefull in many ways. An invite is no longer needed.There are two ways to join. 1.Press Esc, then go to Chat Settings, then go to the tab Channels, then type ''Echelon Alliance'' click join. If your new to the fleets dont forget to check out our introduction post on our fleetwebsite. 1.000.000 Overal Fleet Contributions, be a daily player and take on some fleet supervising roles. Promotions after Flag Officer will require teamspeak requirement and all above.Mail me for Info. Note that you have to contact me in order for me to check, cause i dont have the manpower to contact everyone that meet those requirements.However occasionally you could receive a message that your eligable for promotion.If your interested in getting higher in rank and have question about those requirements dont hesitate to ask. I hope you all are enjoying Season 11.5, there is allot of new stuff that was added to the game.Esspecially the skill revamp is the biggest change.I know allot of you might have questions about that, so we created a special forum discusion thread where you can ask your questions or evem to give your advice. Check out: Build Advice, there you will find three sticky threads Tactical/Engineering/Science Skill Tree Discussion.I already have posted some basic skilltrees for tactical captains if you have one clue where to start. On other news, At the moment there is bug with inviting members to the fleet, IT IS NOT POSSIBLE TO INVITE MEMBERS TO ANY FLEET.It will give the message that it is at full capacity.I wanted to make you aware of the situation. On a bitter note, We say goodbye to Admiral Munshower, he left the game/fleet due to health reasons and time constraints.We thank him for his services and wish him well. If you guys have have any questions, reply to this mail. For those who were unable to attend the monthly meeting this past Saturday, and may not have received the emai, there is an important item that I need everyone to know. Effective Saturday, April 9th 2016, Alan has stepped down as Senior Admiral for Echelon Alliance. Alan will not be leaving the fleet, however. He has taken the rank of Captain, and will continue to be an active fleet member, but will no longer be a Staff Officer. In the interim, Asara and I will be taking on his responsibilites. Asara will be taking care of promotions, and I will handle personnel issues and initiatives within the Alliance (I will not be taking on any responsibilites for the KDF) We wish Alan all the best in his future endeavours. On the subject of our website, Asara and I have deeply discussed future plans for many items, including our Internet presence.We plan on purchasing our own domain name, increasing storage and bandwidth limits, and performing an overhaul of our site. We also are going to tie in our YouTube channel and Twitch live feeds. I am throwing out a challenge to all fleet members, especially to myself and the other Staff Officers to be much more active on our website. There is a ton of instructional posts, "how to's", general regulations, etc, that can be found on our site. We would also love to see as many as possible on our TeamSpeak server. You can download the free client (https://www.teamspeak.com/downloads), install the client for your particular operating system, and login to the following server. 8.9.15.232:9291. Please understand that this server is 18+. Greetings Echelon Division and Echelon 2nd Division! I would like to remind everyone that we have a monthly team meeting, next Saturday. Please check the 'Events' tab in the 'My Fleet' dropdown. There, you will see the meeting time (in your timezone) and allow you to RSVP. Depending on the size of the group, we either meet at our Starbase or the R&D conference room. This is the perfect opportunity to meet the Staff Officers and other fleet members. After the Staff presentation, we open the floor for questions. One item that we would like to know is this. Are there any fleet members that would be interested in the opportunity to become a Staff member in Division? If so, please let one of the Admirals know. We would also like to hear feedback from anyone regarding ideas or suggestions to better our fleet. If you cannot attend the meeting, you can contact one of the Staff Officers, via in-game email. For Federation members, you can contact: @ryanwire or @wmunshower. We would also love to see as many as possible on our TeamSpeak server. You can download the free client, and login to the following server. 8.9.15.232:9291. Please understand that this server is 18+. Stop by and discuss all thing STO. We have discussions about ship builds, DPS improvement, and we LOVE running private fleet STF matches. We primarily run PVE missions, but PVP will be making a comeback. So, come and join us! Let your voice be heard! The Livestream will feature most likely a variaty of STF's, Fleet Actions, PVP and Ground, and between those queues we will be giving away MASTER KEY prizes for the people that are active on the streams chat. The stream will end with a celabration of the fleets accomplishments and ofcourse the christmas secret santa giveaway. If there are any new updates, then we send a follow up mail. I would like to inform you guys that we will be hosting a special christmas livestream broadcast in a few weeks. (most likely december 19th check the event tab) This livestream will feature a variaty of things such as joint fleet activities, build advice and a holdings celabration party with a nice christmas giveaway.The broadcast will air for an hour and can be followed on your fleetwebsite.This christmas event is something we do every year and its a nice way to keep that tradition dont you think? So how does the christmas giveaway event work? Very simple for all the participents we ask to buy/get something that you would like to giveaway to someone.Then we would randomly pair all the participents and would swap gifts. If we cant get a even number, the fleet itself would provide gifts for the remaining members.We dont have any requirements for gifts, it can basically be anything.Its more about the gesture than the actual gift. Also simple, just RSVP the event on the event tab.Then we know that you will be attending the giveaway. More on this special event will come in a few weeks, stay tuned. Hello to all Alliance Fleet members! We will have a PVP fleet tournament event on the 27th of June . 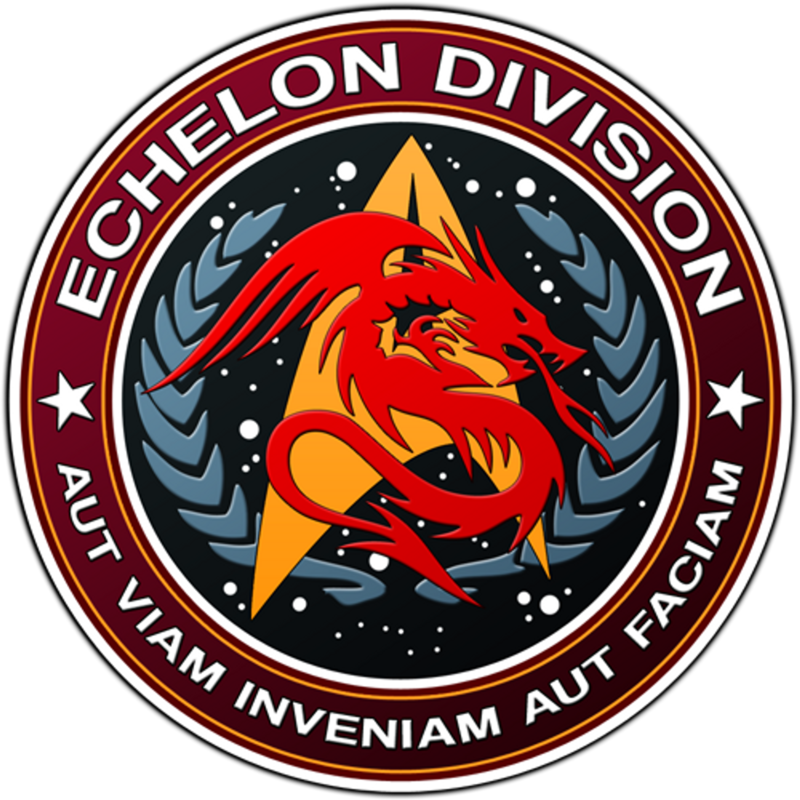 The fleets involved are :Echelon Division / Echelon Legacy / House of Echelon. We need fleet members that wants the oppertunity to join ,for this great interfleet pvp tournament! So .... SIGN UP at the event tab at your fleet roster! Ow.. and dont be scared,or thinking im not good enough , its just for great fun. The winning team gets a nice prize(s). It is also very wise to train with fellow team mates ,and to work on tactics and skills. I am here to introduce a special channel called ''Echelon STF'' this channel will devine the dps monsters and skilled veterans among us.The channel will be used souly for creating STF groups, and in special the ADVANCED variant of the STFS. So we are talking about ISA, KASE and CSA and in the future probably also the ELITE variant.The channel can also be used for other fleet actions. What we dont want is, that the general chat will shift to that channel, please keep that in the Echelon Alliance channel.Because we don't want to seperate us in two different groups.Activity in EA channel is required once an awhile. Join the groups in the EA Channel for parse runs. Once you reach the requirements you'll get a pm that you are invited. Here are some Delta Rising Event details,as you know we have 30 questions.All i say is don't think to hard:) Each question will get you 1 point for a right answer. so in total you can get 30 points, if you answer them all correctly.In case of a tied where more then 3 people have the same amount of points, we will look at the timestamp for the the three fastest ones.Understand that the time on STO is linked to your time on your computer, internet time will be used as a universal time. To be accurate it might not be a bad idea to set your time the same way.Because we look at seconds if we have to. So in certains way the time of submitting is crucial. REMEMBER THAT. When it comes to the giveaway of the actual prizes, The winners NEED to have paypal account or know someone they trust that have one.We explored all kinds of methodes, and we came to the conclusion that paypal is the best course.Our kindly @knologistprime will send the money to your paypal account for you in order to buy it.It might be a problem for some to create a paypal account if you haven't, @knologistprime is willing to help set it up, if you would want that.